Nicola Sturgeon has said there will not be another Scottish independence referendum until "the terms of Brexit are clearer". "We will not seek to introduce the legislation for an independence referendum immediately," the first minister said. In March Ms Sturgeon had said she wanted to give Scots a second chance to vote on leaving the UK some time between the autumn of 2018 and the spring 2019. But she has now said that while the Scottish Government "remains committed strongly to the principle of giving Scotland a choice at the end of this process", she has "reset" her timetable. She will now focus her party's attention on influencing the Brexit outcome so that it will be favourable to Scots. That includes securing Scotland's place in the single market, with "substantial new powers" for Holyrood, she said. "We will do everything we can to influence the UK in that direction," Ms Sturgeon said. 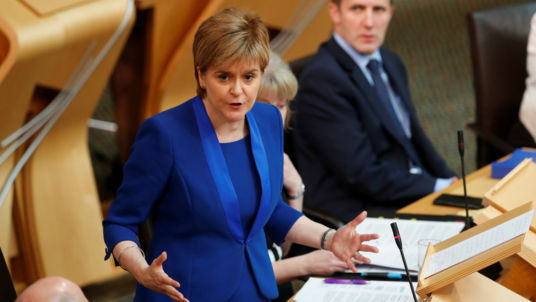 Scots voted against independence by 55% to 45% in a referendum in 2014, but Ms Sturgeon has called for a new vote in the wake of Brexit, as Scots are overwhelmingly opposed to leaving the European Union. However, her plans suffered a setback with a weak performance in the General Election, when the SNP lost 21 seats. Speaking to MSPs at Holyrood, Ms Sturgeon said: "The Conservative Government at Westminster are taking this country down a path that is potentially the most damaging thing that has happened to us for a generation or more. "We do not know the destination of that journey but what we do know is that if the Tories get their way, the outcome of this could be devastating for Scottish jobs, for trade, for living standards, for the opportunities for generations to come. "I do not think it is right for Scotland to be left at the mercy of wherever the Tories want to take us regardless of how damaging that is to our present and to our future." Earlier, Theresa May had urged Ms Sturgeon to take a demand for a second independence referendum off the table. "What I think Nicola Sturgeon should be saying today is that she's going to completely take off the table the question of Indy Ref 2, a second independence referendum in Scotland," the PM said. Her comment was echoed by Scottish Conservative leader Ruth Davidson during a debate at Holyrood. "Most people don't want this brought back anytime soon," said Ms Davidson. "Why doesn't she give the country some certainty and just take it off the table for the rest of this parliament?" Sky News' Scotland Correspondent James Matthews says Ms Sturgeon's new stance reflects the lack of support on the issue. "She doesn't have the public support - that's what the numbers at the General Election told her. "Essentially, in the immediate term it's a project going nowhere. She needs to shore up support."